On Tuesday we found out our real estate agent had scheduled an open house for tomorrow (Saturday). We panicked. We wrote up a to do list to prove to her we couldn’t be ready. Our list was 3 pages long & this was after a week of solid work (by ourselves & anyone we could convince to help). Well, tomorrow morning I have to run back to the house to put a last coat on the bathroom trim & pass a mop over a few of the floors. Everything on the list is done! Ok, I lie, we still need to finish up the deck outside of the kitchen but that was a task we knew we wouldn’t be able to finish in time. Without the motivation of the deadline I’m not sure we would be at this point right now but I’m pretty damn proud of us. We bought this house a little more than 5 years ago. At 140 years old it needed a LOT of work. I big task for a couple who could do little more than paint a wall & change a lightbulb, but with (a LOT) of help from friends & family & a can- do attitude we have made changes, some of them major, in every single room of the house. People keep commenting that we must want to move back in now that everything looks so good & is finally finished (well, with an older house “finished” is kind of a loosely used word) but really we don’t. We are pretty darn proud of what we’ve accomplished, we’ve learned a lot & we’ve grown a lot. We added a lot of blood, sweat & tears to the memories in those walls but we’ve also added laughter & good times. One of my favourite things about those drafty old walls was the sense of time & memory that breathed through it. Knowing that others were born & died, wept & laughed, cozied up through winter storms & threw windows open to warm breezes made me feel part of something more. I will post some before & after pics but the after pics have yet to be taken & I’m too tired tonight to wait for them to upload anyway! My little man’s new favourite play place is the little pond in the garden below our deck. 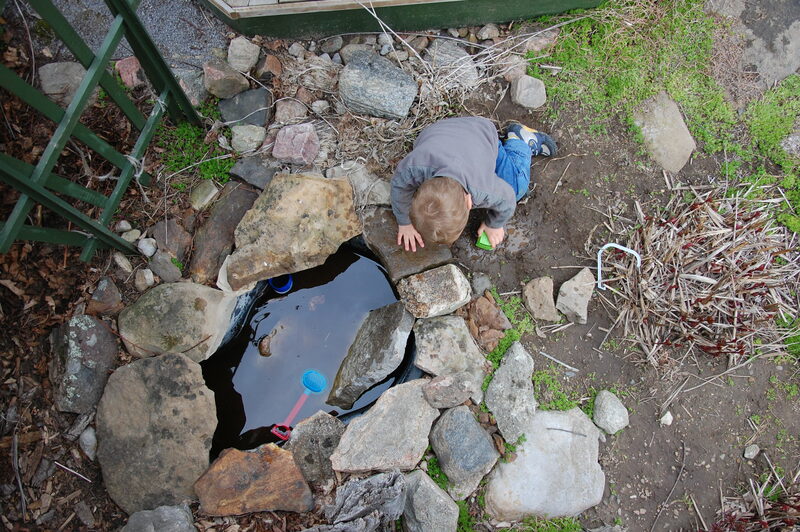 He spends a lot of time there & the pond is slowly getting shallower as more & more rocks & mud & toys are dropped into it. My view of allthe action. This afternoon as I sat on the deck writing I heard the velcro on his shoes & looked down in time to see the running shoes going into the pond. His only shoes that currently fit I will add. Oh well, wet is wet so I did not immediately rescue the shoes. Next time I looked down he was drinking water from the pond out of his shoe.